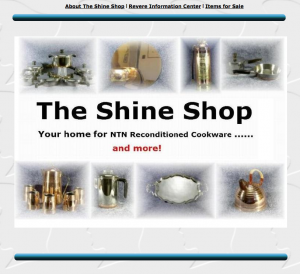 When I first became interested in Revere Ware and started looking for replacement parts (which led me to start this business), a guy named Charlie Anjard ran The Shine Shop, a business that restored cookware to almost new. Charlie was extremely helpful and always willing to answer the odd question. 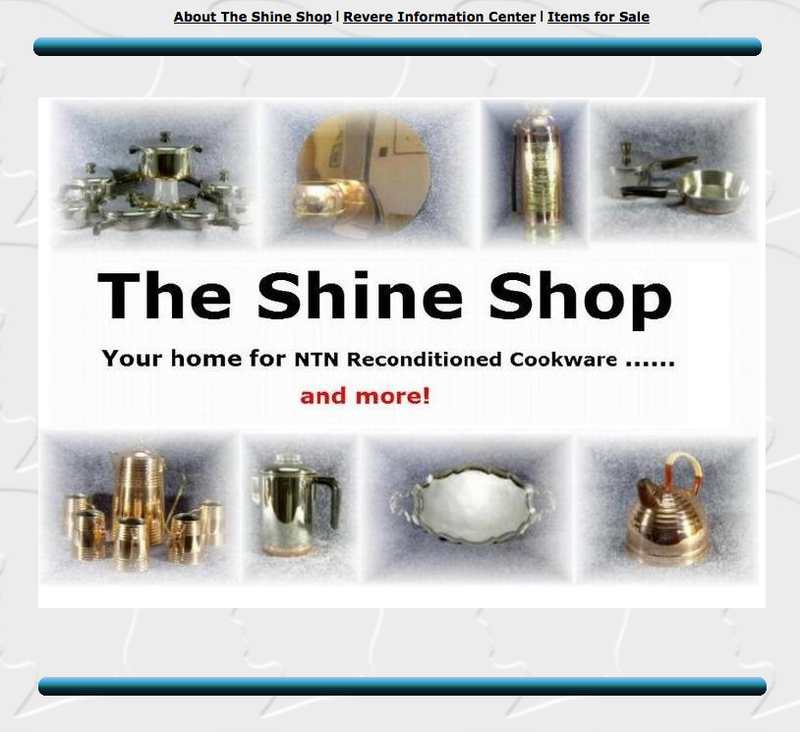 He has unfortunately closed his business due to health reasons, but in the time Charlie ran his business, he was very active in tracking down the history of the Revere Ware company and the geneology of their products, and he compiled all his work in what he called the Revere Info Center. It wouldn’t be a stretch to say that most of what we know about the history or Revere Ware’s products is due to Charlie’s work. Unfortunately Charlie’s original site is offline now, but we archived a copy which you can find here. One of the most helpful pages is the photo guide to Revere products over the years. Hi, is the revere photo guide going to be back on the net? If it isn’t is there an address where I can contact the producer of the site? Read the post a little closer. 🙂 It was announcing that the guide was back up and lists the link in the body of the post. Hello, although Revere coffee pots are shown in ads from 1940 I can’t find any with logos used earlier than 1947. Does anyone know the actual production date for the beginning of production? Has anyone seen one with a “pat. pend.” logo? Hi, a coffee pot with an early “Pat. Pending” finally showed up. Is the Revere patent file still available? The attachment given is no longer active. i think there needs to be a specific coffee pot guide here too. there were several production changes to those pots, and it’s hard to know exactly what’s what. as a fairly reliable rule, the pots with the vertical handles are usually pre-1968 with the heavy cladding, while the pots with the splayed handles are post-1968 with the thin cladding. additionally, there is no spoke pattern on the metal basket inserts and the ‘lid’ of the basket slips down inside (rather than resting on top of the basket) for the pots that have the splayed handle. so, both handle and basket typically go together. however, i have seen a few pots where the splayed handles and new baskets are on are pots with the old logo. the ones i’ve seen like that don’t have any city in the logo–they’re just like the original old-logo pots. so, when did they switch to the newer handle? to complicate this even further…the metal basket inserts are definitely the newer basket design. yes, the baskets can get switched, but i don’t see how the handles can get switched, since the old style has a metal plate down the side for the handle that just isn’t there on the newer splayed design. also, i usually look at how high the copper goes up the sides to help identify the heavy cladding when the bottom isn’t visible. the copper almost always goes much farther up the sides on the pre-1968 pots. and yet, a few of the pre-1968 pots have a very low copper coating on the side of the pot. so, does that mean the correlation to the height of the copper coating on the sides isn’t 100 percent reliable, or are there some older-style pots with the thinner cladding? i don’t have one of those older pots with the low-height coating on the sides or i would surely be able to see and/or weigh for myself if it had the thicker stainless. i’ve noticed some other things too, but those are the most critical to have answered, if anyone knows. I’ve learned that the 1946 or 1947 and older coffee pots all have a deep recessed ring in the bottom outside of the logo. The bottom of the tube platform sits inside of this. Apparently it was unecessary and deleted in later production. In 1938 they used the 1938 ONLY small three quarter inch single circle logo without any fihure of Revere, riding a horse or his bust, no “1801” and no mention of Revere Ware. It only has Revere Copper and Brass Co. and Rome NY plus Pat. Pend. The inside area of the spout has a gridwork of small holes punched in the part that drains from the pot into the spout. The inside lip of the lid has small indents for this year only. The height of these early pots varies slightly and the lid fit varies as well as the heighth of the copper. The copper is straighter on the sides until 1947 and there is an early glass top with a straight ninety degree angle (I have only seen two of these. The only 1938 pot I have seen is the one in my collection. When more examples show up a better understanding of the differences can be discovered.